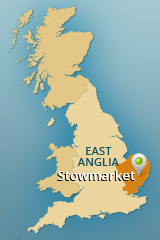 GT Classic Hire being based near Stowmarket in Suffolk is an hour and a half from London via main line railway. Liverpool Street Station. We are only forty minutes from Cambridge, thirty minutes from Norwich and thirty minutes from Essex..
Our range of cars covers from the 1940's with the Triumph 1800 to the 1990's with models from manufacturers; Jaguar, MG, Morris, Triumph, Austin Healey. See the list of specific cars on the left of this page. You can hire one of our cars for typical occasions, such as , birthdays, weddings and anniversaries and can book for 24 hour and 48 hours hires. We also offer a discounted 9am to 5pm single day hire price. Why not come to Suffolk and drive on our lovely winding country roads, through some of the most atttactive villages in the country. Our fleet covers British, European and Far Eastern Classic Cars that you can enjoy cruising around on a sunny Suffolk afternoon. East Anglia has some of the warmest weather in the UK. We can advise you on locations and places to stay and recommend places of interest to visit. The car is supplied with full comprehensive insurance, subject to eligibility, with breakdown assistance. GT Classic Hire also supply Gift Vouchers that are valid for 12 months.